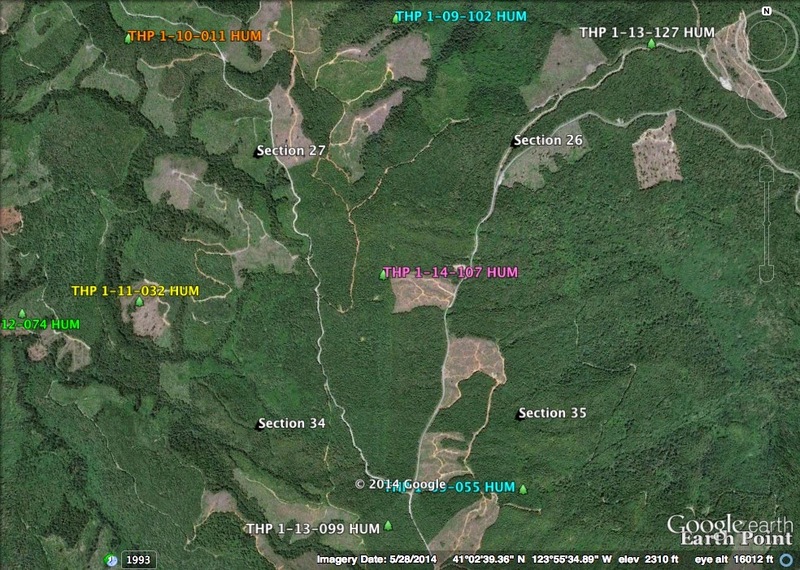 THPBlog: Green Diamond Resource Company to log south of Redwood National Park. Green Diamond Resource Company to log south of Redwood National Park. This THP is about 10 miles east of Trinidad, CA and about 3 miles south of Redwood National Park at an elevation of 290 to 3,380 feet. The THP area drains into the Headwaters of the Little River and Redwood Creek which are listed as impaired for sediment. Green Diamond Resource Company is planning a tractor and cable logging operation in Douglas fir, redwood, grand fir and western hemlock forests. There are 2 landslide terrain sites within unit A; including a dormant young deep seated feature along the western boundary of unit A, and a road cut landslide upslope of road CR 2769 in unit A. Re-construction of 650 feet of the CR 2769 road is proposed through an unstable feature in unit A. 12 road drainage sites are planned for work including rocking, dip construction, ditch cleaning, culvert repair/replacement and road bed stabilization of washed out crossings. There are spotted owl nesting territories within .25 mi of units A,B and C. More information is available on the THP Tracking Center website.